1 A None No Power Seat 1 A is a standard Executive Class seat however, the proximity to the lavatory and galleys may be bothersome. 1 B None No Power Seat 1 B is a standard Executive Class seat however, the proximity to the lavatory and galleys may be bothersome. 1 E None No Power Seat 1 E is a standard Executive Class seat however, the proximity to the lavatory and galleys may be bothersome. 1 F None No Power Seat 1 F is a standard Executive Class seat however, the proximity to the lavatory and galleys may be bothersome. 1 H None No Power Seat 1 H is a standard Executive Class seat however, the proximity to the lavatory and galleys may be bothersome. 1 J None No Power Seat 1 J is a standard Executive Class seat however, the proximity to the lavatory and galleys may be bothersome. 11 A None No Power Seat 11 A is a standard Economy Class seat however, the proximity to the lavatory and galleys may be bothersome. 11 B None No Power Seat 11 B is a standard Economy Class seat however, the proximity to the lavatory and galleys may be bothersome. 11 D None No Power Seat 11 D is a standard Economy Class seat however, the proximity to the lavatory and galleys may be bothersome. 11 E None No Power Seat 11 E is a standard Economy Class seat however, the proximity to the lavatory and galleys may be bothersome. 11 F None No Power Seat 11 F is a standard Economy Class seat however, the proximity to the lavatory and galleys may be bothersome. 11 G None No Power Seat 11 G is a standard Economy Class seat however, the proximity to the lavatory and galleys may be bothersome. 11 H None No Power Seat 11 H is a standard Economy Class seat however, the proximity to the lavatory and galleys may be bothersome. 11 J None No Power Seat 11 J is a standard Economy Class seat however, the proximity to the lavatory and galleys may be bothersome. 2 A None No Power Seat 2 A is a standard Executive Class seat. 2 B None No Power Seat 2 B is a standard Executive Class seat. 2 E None No Power Seat 2 E is a standard Executive Class seat. 2 F None No Power Seat 2 F is a standard Executive Class seat. 2 H None No Power Seat 2 H is a standard Executive Class seat. 2 J None No Power Seat 2 J is a standard Executive Class seat. 27 B None No Power Seat 27 B is a standard Economy Class seat however, the proximity to the lavatories may be bothersome. 27 D None No Power Seat 27 D is a standard Economy Class seat however, the proximity to the lavatories may be bothersome. 27 E None No Power Seat 27 E is a standard Economy Class seat however, the proximity to the lavatories may be bothersome. 27 F None No Power Seat 27 F is a standard Economy Class seat however, the proximity to the lavatories may be bothersome. 27 G None No Power Seat 27 G is a standard Economy Class seat however, the proximity to the lavatories may be bothersome. 28 A None No Power Seat 28 A is a standard Economy Class seat however, the proximity to the lavatories may be bothersome. 28 B None No Power Seat 28 B is a standard Economy Class seat however, the proximity to the lavatories may be bothersome. 28 H None No Power Seat 28 H is a standard Economy Class seat however, the proximity to the lavatories may be bothersome. 28 J None No Power Seat 28 J is a standard Economy Class seat however, the proximity to the lavatories may be bothersome. 29 D None No Power Seat 29 D is a standard Economy Class seat that has extra legroom due to the exit row however, may also have limited to no recline due the exit behind. The proximity to the lavatories may be bothersome. 29 E None No Power Seat 29 E is a standard Economy Class seat that has extra legroom due to the exit row however, may also have limited to no recline due the exit behind. The proximity to the lavatories may be bothersome. 29 F None No Power Seat 29 F is a standard Economy Class seat that has extra legroom due to the exit row however, may also have limited to no recline due the exit behind. The proximity to the lavatories may be bothersome. 29 G None No Power Seat 29 G is a standard Economy Class seat that has extra legroom due to the exit row however, may also have limited to no recline due the exit behind. The proximity to the lavatories may be bothersome. 3 A None No Power Seat 3 A is a standard Executive Class seat. 3 B None No Power Seat 3 B is a standard Executive Class seat. 3 E None No Power Seat 3 E is a standard Executive Class seat. 3 F None No Power Seat 3 F is a standard Executive Class seat. 3 H None No Power Seat 3 H is a standard Executive Class seat. 3 J None No Power Seat 3 J is a standard Executive Class seat. 30 A None No Power Seat 30 A is a standard Economy Class seat that has extra legroom due to exit row. 30 B None No Power Seat 30 B is a standard Economy Class seat that has extra legroom due to exit row. 30 D None No Power Seat 30 D is a standard Economy Class seat that has extra legroom due to exit row. 30 E None No Power Seat 30 E is a standard Economy Class seat that has extra legroom due to exit row. 30 F None No Power Seat 30 F is a standard Economy Class seat that has extra legroom due to exit row. 30 G None No Power Seat 30 G is a standard Economy Class seat that has extra legroom due to exit row. 30 H None No Power Seat 30 H is a standard Economy Class seat that has extra legroom due to exit row. 30 J None No Power Seat 30 J is a standard Economy Class seat that has extra legroom due to exit row. 38 D None No Power Seat 38 D is a standard Economy Class seat however, this seat may often be bumped into by service carts or others passing due to the configuration transition from 4 to 3 seats. 4 A None No Power Seat 4 A is a standard Executive Class seat however, the proximity to the lavatory and galleys may be bothersome. 4 B None No Power Seat 4 B is a standard Executive Class seat however, the proximity to the lavatory and galleys may be bothersome. 4 E None No Power Seat 4 E is a standard Executive Class seat however, the proximity to the lavatory and galleys may be bothersome. 4 F None No Power Seat 4 F is a standard Executive Class seat however, the proximity to the lavatory and galleys may be bothersome. 4 H None No Power Seat 4 H is a standard Executive Class seat however, the proximity to the lavatory and galleys may be bothersome. 4 J None No Power Seat 4 J is a standard Executive Class seat however, the proximity to the lavatory and galleys may be bothersome. 42 A None No Power Seat 42 A is a standard Economy Class seat in the last row the plane. This seat may have limited recline and the close proximity to the lavatories and galleys may be bothersome. 42 B None No Power Seat 42 B is a standard Economy Class seat in the last row the plane. This seat may have limited recline and the close proximity to the lavatories and galleys may be bothersome. 42 E None No Power Seat 42 E is a standard Economy Class seat in the last row the plane. This seat may have limited recline and the close proximity to the lavatories and galleys may be bothersome. 42 F None No Power Seat 42 F is a standard Economy Class seat in the last row the plane. This seat may have limited recline and the close proximity to the lavatories and galleys may be bothersome. 42 G None No Power Seat 42 G is a standard Economy Class seat in the last row the plane. This seat may have limited recline and the close proximity to the lavatories and galleys may be bothersome. 42 H None No Power Seat 42 H is a standard Economy Class seat in the last row the plane. This seat may have limited recline and the close proximity to the lavatories and galleys may be bothersome. 42 J None No Power Seat 42 J is a standard Economy Class seat in the last row the plane. This seat may have limited recline and the close proximity to the lavatories and galleys may be bothersome. 110V outlets are available at all Executive Class seats. This Airbus A330-200 is primariliy used on medium to long-haul flights. It features 24 angled flat seats in Business Class and 244 standard Economy seats. The extra leg room seat 11F is not as good as the seats on row 30. The leg room is extremely limited and does not allow the passenger to stretch her legs as the ones in the exit rows. If you need extra legroom, the seats on row 11 are not for you. I flew from Recife to Lisbon on the CS-TON and, after a dreadful Lisbon-Recife flight in an older aircraft some days before, I had a very positive experience. For a first row seat (with the table in the arm rest) this one has a very good width. This and the great legroom allowed me to sleep a lot, what was kind of a pity, because the entertainment system, on demand and with touch screens, is very good. Seats in rows 39 to 42 E,F,G (all in the middle section) have significantly less leg room than window seats. in the same row. 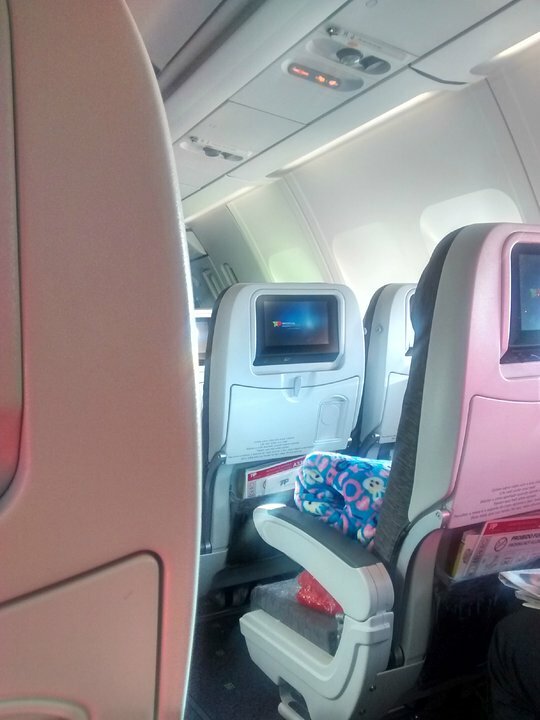 This can be clearly seen when in these seats and was confirmed to a fellow passenger behind me by a flight attendant. AVOID!